I've been wanting a new logo for a while now. The lonely baby on the moon, all by herself and face-down... definitely not the image of a loving babywearing pair that sleeping baby productions should bring to mind. I described a vague idea to my longtime internet pal Molly, send her the photo that's on my front page, and she worked her magic on it. And I think it's perfect! 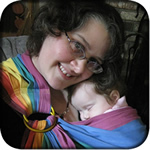 The first iteration had the caregiver with long flowing hair, which I loved, but one of my core ideals is that babywearing is for everyone -- not just mothers, but fathers, aunts, uncles, grandparents, babysitters, and anyone who cares for babies. So I asked her to make the wearer as neutral as she could, to allow people who see the logo to imagine themselves in the picture, no matter their gender or skin color. I hope the image works that way for you!